We checked out of our hotel in Sorrento this morning after breakfast, walked over to pick up our rental car from Europcar (Sorrento City Office, Corso Italia, 210/A), conveniently located between the train station and our hotel, and then headed out for our highly anticipated drive along the Amalfi Coast. 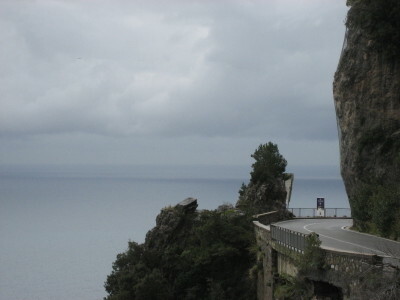 Once we made our way out of Sorrento and got over to the coastal road, we found it to be as scenic as we had always heard, even with the intermittent rain showers, but not at all as torturous as some of the stories we had been told. 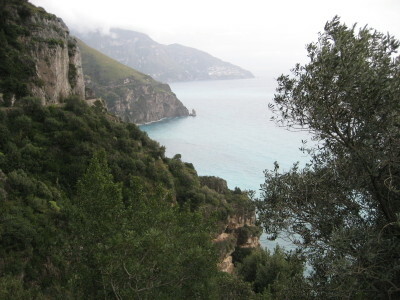 It turned out to be only about 15 kilometers to our first destination of Positano, and even with all of our stops along the way to take in the views, it took only about a half an hour to get there, along the reasonably wide road. Except for the boxy blue city buses that we had to squeeze by once in a while, we didn't encounter too much traffic on the way. 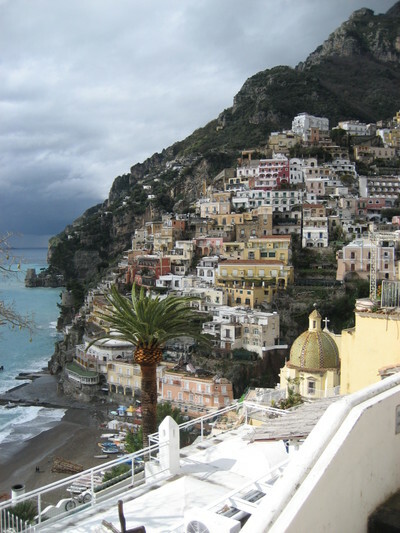 Positano was as picturesque as we had imagined it would be, with its colorful Mediterranean houses piled on top of each other, cascading down the rocky hillside, tumbling haphazardly toward the sea. After winding our way into the center of the village and finding a conveniently-situated small supervised parking lot to park our car, we set out on foot to explore the nooks and crannies of this quiet village of approximately 3900 inhabitants. It was very sleepy and quiet this morning, but judging by the large number of hotels we came across, I imagine that “sleepy” and “quiet” are not words normally used to describe this area during the busy tourist season. The advantage of traveling this time of year is that we get to explore beautiful places like Positano without having to deal with hordes of tourists. The disadvantage of traveling this time of year is that many hotels, restaurants, etc., have their annual closures at this time, so we don’t have as many options open to us. Thus, we had no luck in our search for an espresso bar or a small café this early in the morning. 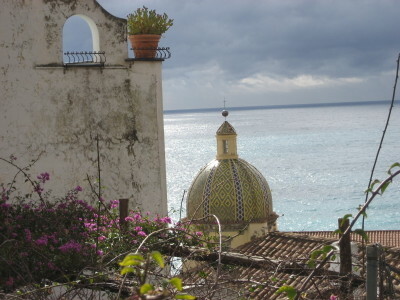 So, instead, we just meandered along the narrow cobbled streets, under the leafy pergolas, past the colorful tiled church domes, climbing up the walkways to get a glimpse at the views over the Mediterranean, and then descending down to the dark sandy beach where we could look up at the village houses nestled against the craggy hills. And, we didn’t have to use our umbrellas ! The coastal road narrowed a little bit once we left Positano on our way toward the town of Amalfi, and there was a bit more traffic, including more of those boxy blue city buses, but it still wasn’t that bad, and it only took about 25 minutes. We parked our car in a large unattended parking lot, just outside of the center of town, and climbed the narrow walkways into the village. Only once did we have to stand aside so that a group of men with their mules loaded down with building supplies could get past us on the tight path. By this time we were in full use of our umbrellas as we hungrily searched for a place for lunch. There were not a lot of options for lunch today, and the places we had in mind were all closed for the season. However, we did luck out when we stumbled upon a small place called Ristorante La Taverna del Duca (Piazza Spirito Santo, 26, tel: 089.87.27.55), where we dined on bresaola, tagliatelli with chickpeas and shrimp, a whole grilled fish, and a chilled white wine. After lunch we toured the monumental complex of the Cathedral of Amalfi, which includes the Cloister of Paradise, the museum in the Basilica of the Crucifix, and the Crypt of St. Andrew where the head and other bones of the first disciple of Christ are now preserved. 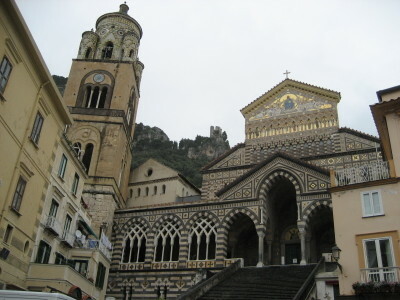 St. Andrew never actually visited Amalfi himself, but for some reason, his body parts were shipped here in the year 1208, and here is where they remain.